But there is a grain of truth in it. Italian food in Italy is not the Italian-American food served at most restaurants in the U.S. And that’s surprising to some American travelers. Italian pizza does not always have sauce, for example, and the crust is generally very thin and crispy -- almost like a cracker. Pasta dishes tend to be simpler, the plates smaller. I don’t think I’ve ever seen garlic bread in Italy. And a latte is a cup of hot milk, not a coffee drink. Most Italian restaurants in the U.S. serve an Italian-American cuisine. And I’m not saying that’s a bad thing! Each region in Italy boasts a distinctive palate. Where large groups of immigrants from Milan settled in the U.S., there polenta and risotto may be more prevalent than pasta. Where the immigrants came from Venice, delicate seafood dominates. And where the Sicilians settled, tomatoes abound and the spices tend to be a bit... spicier. I’m partial to New-York-Little-Italy-style Italian-American food. Rich, hearty, and flavorful. And I have a marinara recipe that simply is fabulous. I can’t take credit for this recipe. It has been a family favorite since my mom saw it in a newspaper long ago. Brava! to whoever created it. It is delicious! In a large pot, saute the garlic, parsley in olive oil. Stir in all of the other ingredients. Bring to a boil and simmer (covered) for 2 hours, stirring occasionally. Remove the bay leaf. A Note: this recipe makes for a very chunky sauce. Not a fan of chunky tomato sauce? Me either. 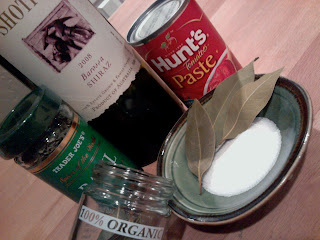 I use a stick blender or a regular blender to make it nice and smooth after removing the bay leaf. pop out the “pucks” of sauce and store in a ziplock baggie -- perfect to microwave for one person. You might remember my visit to the Mercati Rialto a few months ago. Today Venice Daily Photo has an image from Venice's famous market along with a recipe for a fresh tomato sauce, Venetian-style. Enjoy! Can't wait to try the recipe, thanks for posting it! yum!! and i am laughing at the comment abt olive garden. UGH. Makes me want to head back to the restaurant in Florence (Cighiale Bianco, I think) for lardo and pasta! yum....Italian food. @Kelly: let me know what you think! @JessieV: I know. Laughing and crying. Oh my! The darling husband and I both groaned when we heard the Olive Garden remark since we lived in the USA for a few years. You explained the settlement and food patterns quite nicely! Sounds great - thanks for sharing. It's also so very true of "Mexican" food. While it's all pretty wonderful, I'm especially partial to "Tex-Mex". Makes perfect sense this is true for "Italian" food as well. I, too, groaned at the Olive Garden mention. But, this recipe looks yummy and will definitely go into my recipe file for future taste testing!